Arnold Marinissen, Stephan Meier and Peppie Wiersma, who all studied percussion at The Hague's Koninklijk Conservatorium until 1994, have since worked together to unify instrumental perfectionism and unpretentious performance forms. 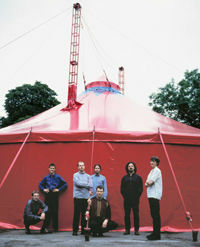 In 1998 they founded the Dutch-German Ensemble S, which has appeared at the Lower Saxony Music Days, Muziekcentrum Vredenburg in Utrecht, Sprengel Museum Hannover, Rotterdamse Kunststichting and Badischer Kunstverein. In January 2001 their Dutch premiere of György Ligeti's Percussion Quartet with Mezzo-Soprano created a storm of admiration. Massimo Mariani (Chief Engineering) and Walter Prati (president) are founder members of the MM&T (Musica, Musicisti & Tecnologie) group in Milan, which since 1990 has addressed the research and performance possibilities of electronic sound production from the musician's and composer's point of view. Along with their highly successful concert programmes using unconventional presentation methods and an emphasis on free improvisation, frequently with world-renowned soloists such as Evan Parker, Stefano Scoddanibbio or Giancarlo Schiaffini as guest musicians all over Italy, in Australia, Helsinki, New York and elsewhere, they are in great demand for their electronic soundscapes. Their first joint venture with the percussionists of Ensemble S was in 1996 at La Scala, Milan on a programme with works by Edgard Varèse.